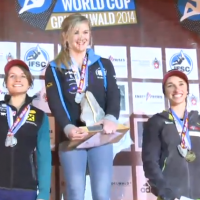 The 3rd stop on the 2014 IFSC Bouldering World Cup circuit took place this weekend in Grindelwald, Switzerland with Germany’s Jan Hojer winning his 2nd gold medal of the season and the UK’s Shauna Coxsey winning her long-awaited first gold medal. The women’s event came down once again to a battle between Shauna Coxsey and Anna Stöhr, with Stöhr sitting in first place as Coxsey came up to attempt the final problem. After being denied victory under similar circumstance the week prior in Baku, Coxsey was able to come out and complete the final boulder in exciting fashion to secure her first World Cup gold medal after finishing runner-up five times in the past three seasons. American Alex Puccio was once again in finals, but unfortunately her string of disappointing (for her) finals performances continued with a 5th place finish. The men’s event was a repeat of the first two stops with Jan Hojer and Dmitrii Sharafutdinov vying for the top spot. Ultimately, it was Hojer securing his 2nd victory of the season, narrowly edging Sharafutdinov with three fewer attempts for his three completed boulder problems. Jernej Kruder, who was in first place after semi-finals, did not report to isolation in time for finals and therefore did not compete in finals. If you missed the live stream of the comp, you can check out full replays of semis and finals here. 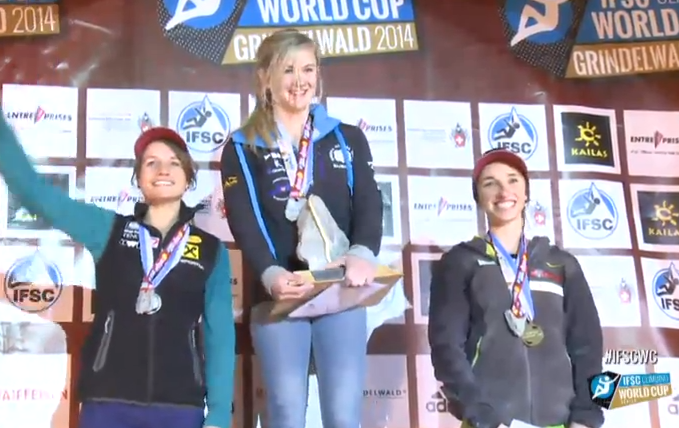 The 2014 World Cup circuit rolls on this coming weekend with a stop in Innsbruck, Austria. It will be interesting to see how the climbers adapt to four consecutive weekends of competing. Stay tuned for more information on that as the comp draws near.